Slapping a closed silk fan into his outstretched palm, a slight, elderly CaoDai devotee wearing a white tunic, white trousers and sporting a low, jaunty black turban, fires off loud Vietnamese to Binh, our interpreter and tour guide. 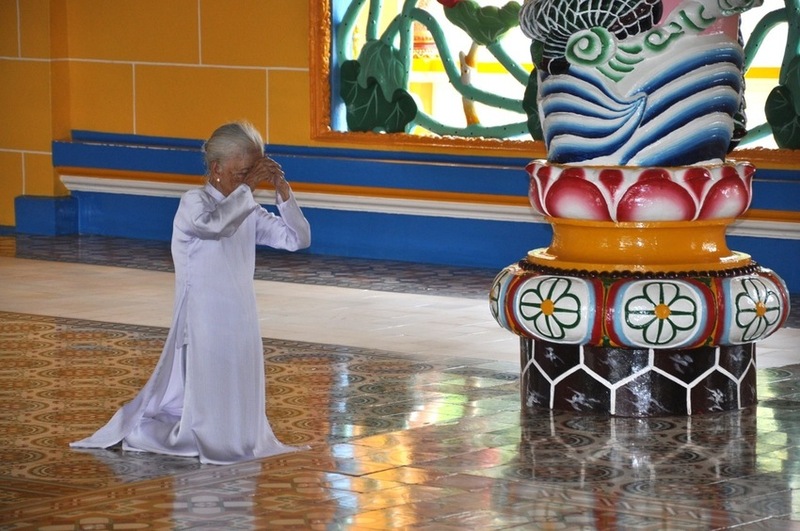 The devotee follows us as we pad barefooted through the sanctuary of the largest CaoDai temple in the world, located in Vietnam’s Tây Ninh Province. 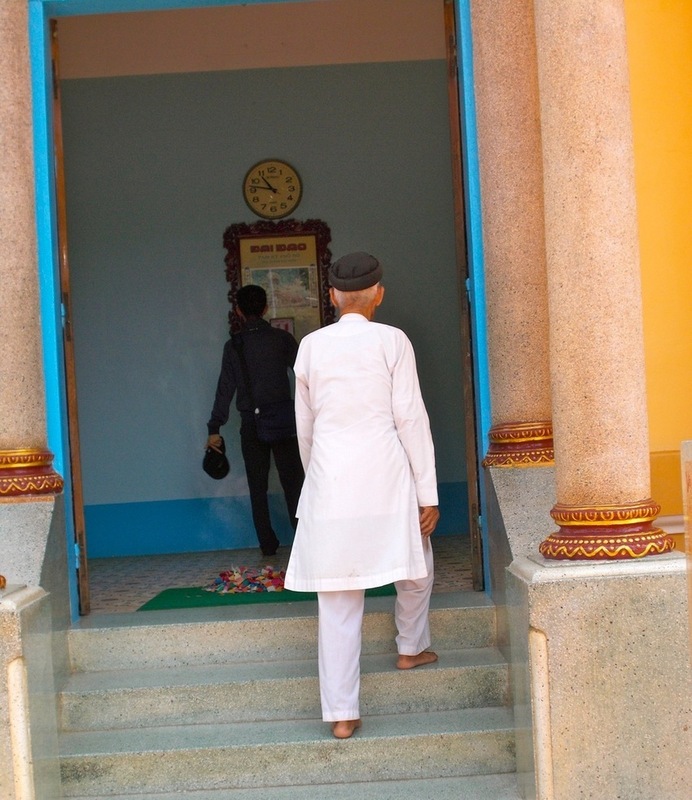 According to Binh, who occasionally glances up from reading the CaoDai reference book I brought from the US, the old man is with temple security. He wears a yellow, blue and red striped armband (oddly resembling the Colombian flag), which indicates his position. The CaoDai bouncer continues his lecture as he walks with us, making a whapping sound every time he bangs the fan into his hand. I’m fairly certain my friend, Debbie, and I have upset him. It could have been the photos we took earlier of worshippers kneeling and holding their bent arms in a triangular formation with their hands clasped together at their foreheads. It’s tempting to document everything in the “Holy See,” the headquarters of CaoDai, a blended religion that incorporates primary tenets of Confucianism, Taoism, Buddhism, Islam, Christianity and Judaism. According to University of Southern California anthropologist and CaoDai scholar, Janet Hoskins, the syncretistic sect attracts more than six million followers worldwide. 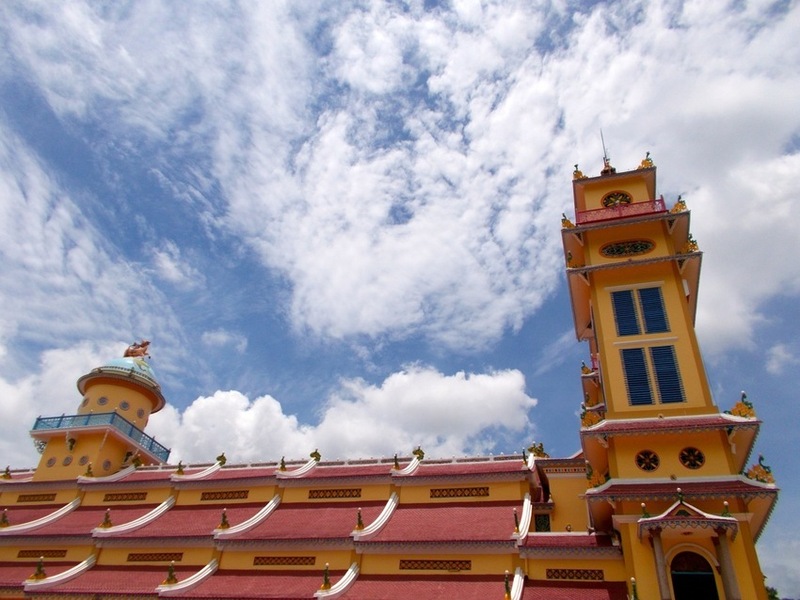 The exterior of the temple features balconies, curled pagoda style roof edges, minarets and statues of saints. Constructed from the early 1930s to the mid 1950s, the building reflects architectural influences from the various religions it represents. The temple’s décor definitely messes with the brain regarding what to process first. The spacious sanctuary bombards visitors with bright yellow brick walls, blue trim and shiny multi-patterned floor tiles. 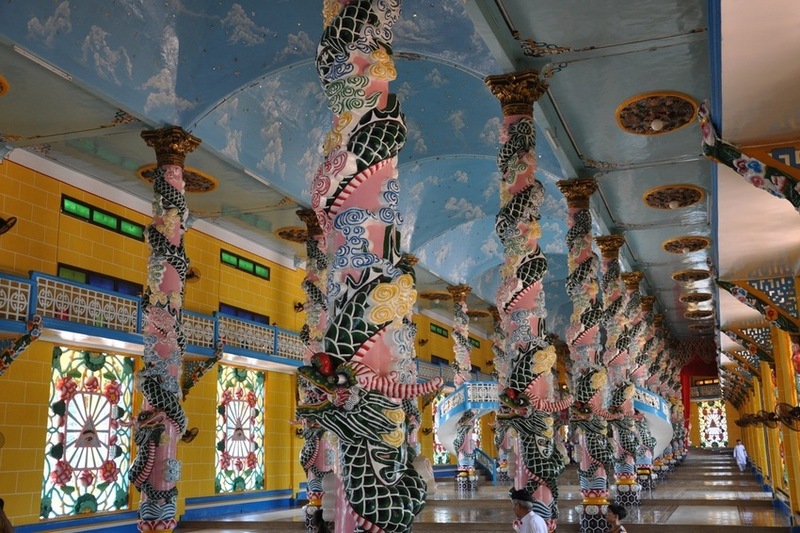 Pink columns feature spiraling green dragons, flowers, colorful swirls and curlicues rising up to the pastel blue ceiling painted with fluffy clouds and embellished with silver sparkly stars and dragon light fixtures. It feels like Dr. Seuss, Willy Wonka, “Happy Tree” artist Bob Ross, along with the Easter Bunny, all served on the temple’s interior design committee. 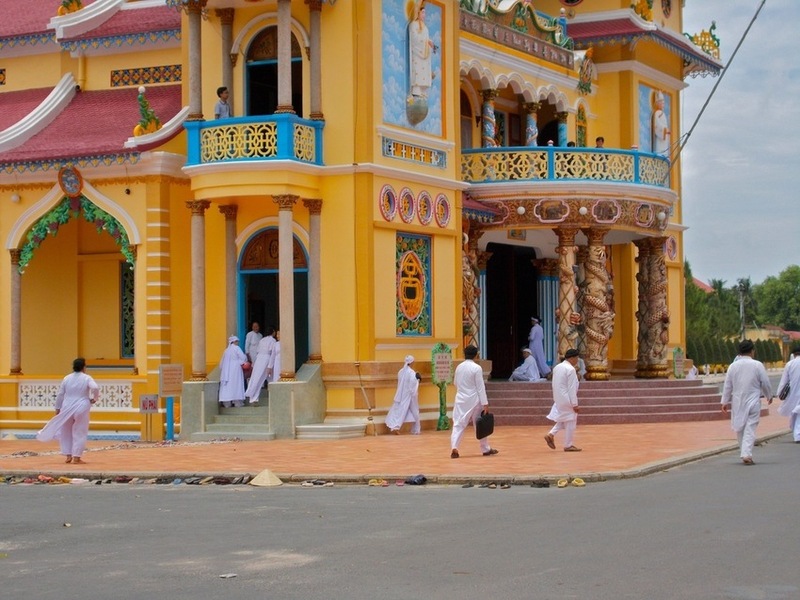 Understandably, the Holy See, about 90 km from Ho Chi Minh City, has become a tourist draw. Consequently, Debbie and I have been taking several pictures of the crazy place. However, Binh is behaving badly, too. Apparently, he’s reading CaoDai contraband from Amazon.com. “We are not allowed to have books like this,” he cryptically tells me moments before the CaoDai deputy confronts us. Perhaps the book isn’t government sanctioned, but I’m too distracted to ask since the elderly guard keeps spouting off what probably is a list of our multiple offenses. 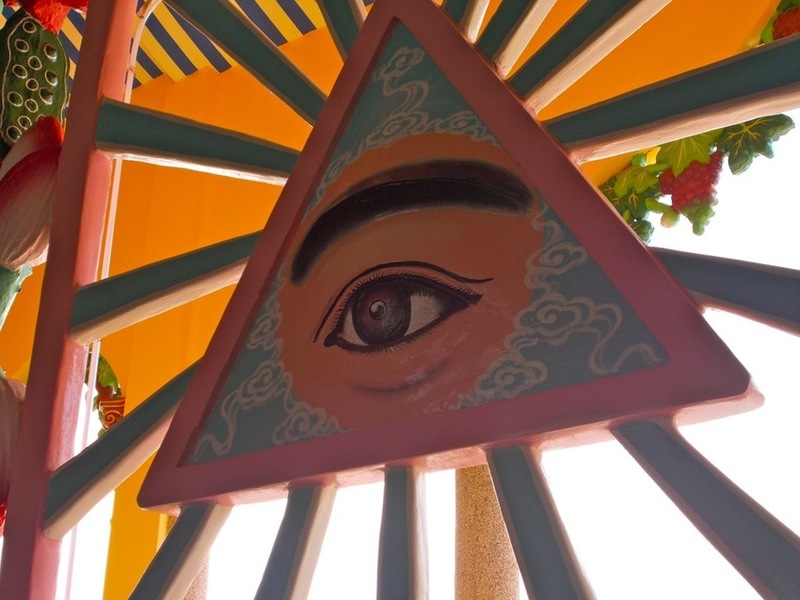 In CaoDaism, which was founded in 1926 as a universal yet uniquely Vietnamese religion, the Divine Eye (Thien Nhan) symbolizes the faith’s all-knowing Supreme Being. 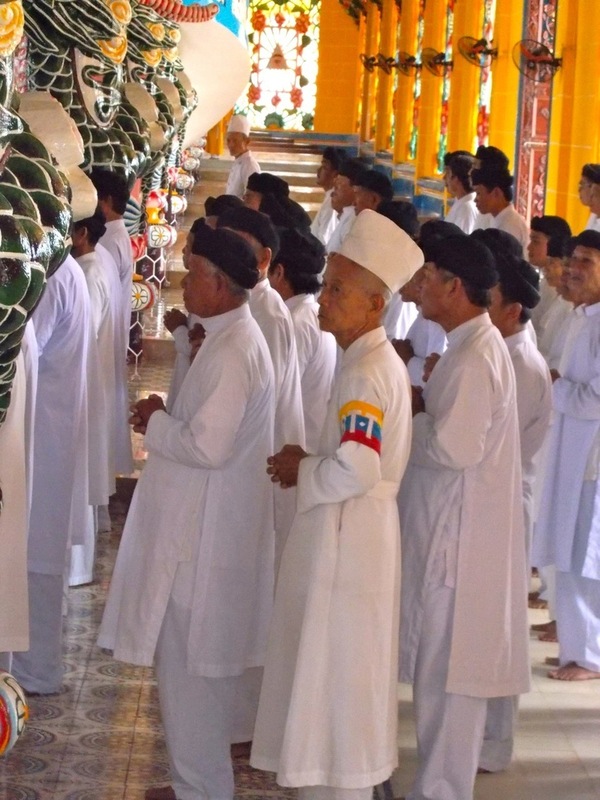 According to CaoDai: Faith of Unity by CaoDai leaders, Ngasha Beck and Dr. Hum Dac Bui, one of the main beliefs of the faith is that all religions came from the same source, and in the beginning, all followers, despite being from different regions and cultures, communicated directly with one god. As populations grew, people lost this direct line with the Supreme Being and with each other, so the religions of the world developed separately without knowledge of their common origin. 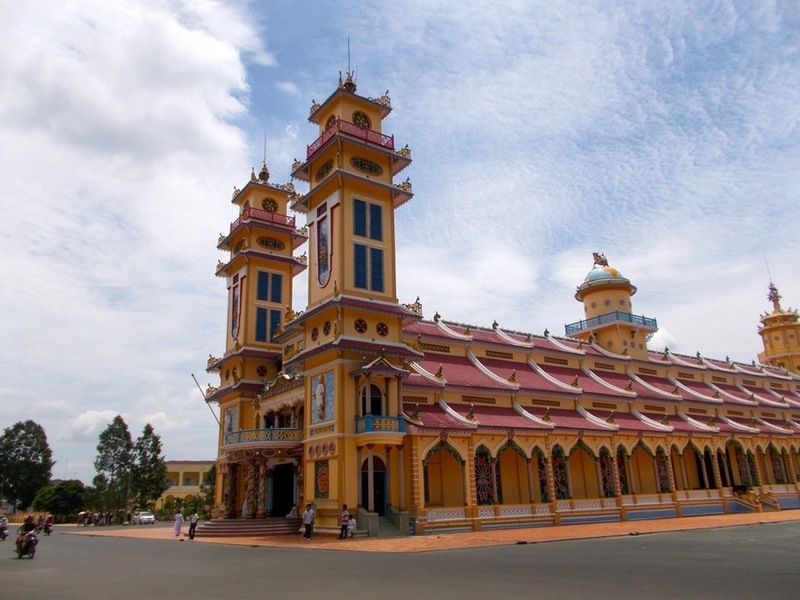 However, Ngo Van Chieu, a laid-back Vietnamese governor of Phu Quoc Island, had a vision in 1920 during which the Supreme Being told him to create CaoDai by reuniting the world’s religions and spreading the word. While, essentially, CaoDaism incorporates the greatest hits of several religions, Dr. Hum maintains that love and justice are the fundamentals of CaoDai doctrine. CaoDaists also practice a lifestyle of “physical and spiritual purification.” Consequently, they avoid, meat, alcohol and drugs; they meditate, channel spirits and saints; and as in most religions, they value peace, compassion, love, altruism, humanity and family. Our bouncer stops whapping the fan. He seems to guess correctly that Binh delivered the news: the CaoDai deity, indeed, is displayed on our American currency. Fumbling around in my purse, I retrieve a dollar from my vinyl Wal-Mart wallet to give it to the deputy. 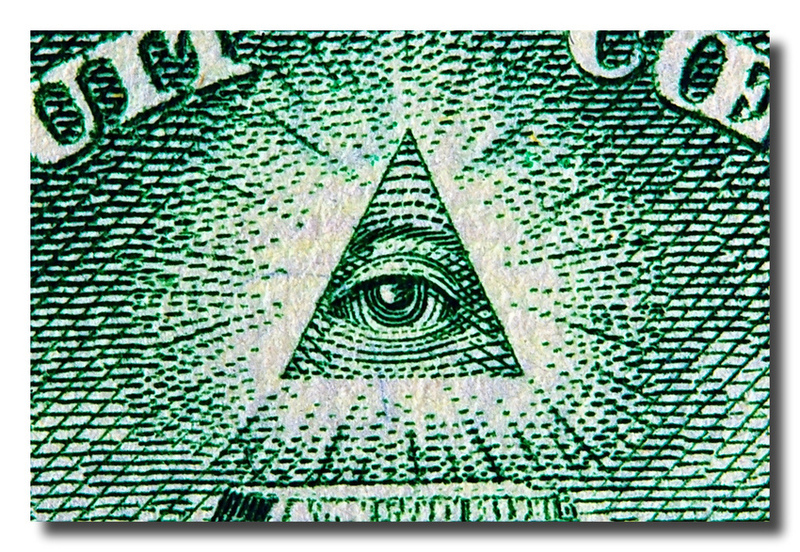 He turns the dollar over and points repeatedly at the eye within the glowing severed top of a pyramid, hovering above the remaining structure. With a thumbs up, he flips the dollar back over and in halting English, identifies the first president of the Untied Sates. “George Washington,” he says, smiling. It doesn’t seem unusual that he would know the US president, considering Washington’s contemporary, Thomas Jefferson, is a CaoDai saint. According to devotees, Jefferson and a slew of other westerners communicated with CaoDai leaders through séances. These saints include, Joan of Arc, Rene Descartes, Vladimir Lenin, William Shakespeare, Winston Churchill and Charlie Chaplin. 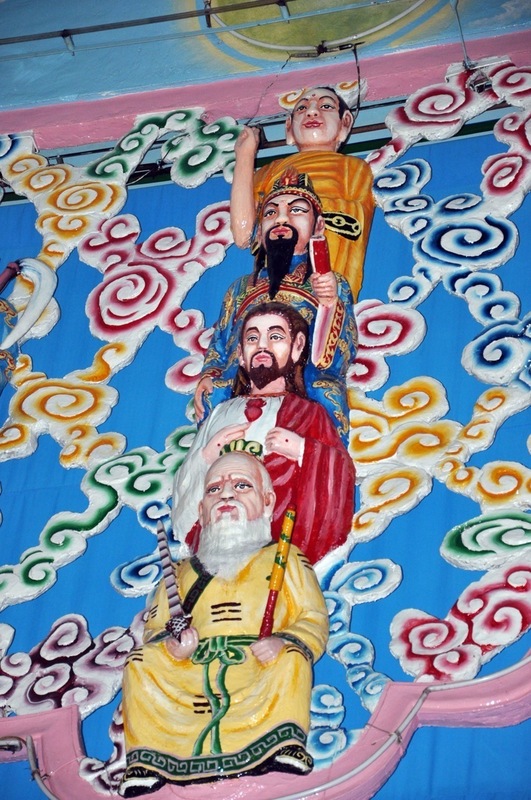 Buddha, Jesus Christ, Moses, Laozi (founder of Taoism), Confucius and Mohamed are prominent CaoDai holy guides as well. 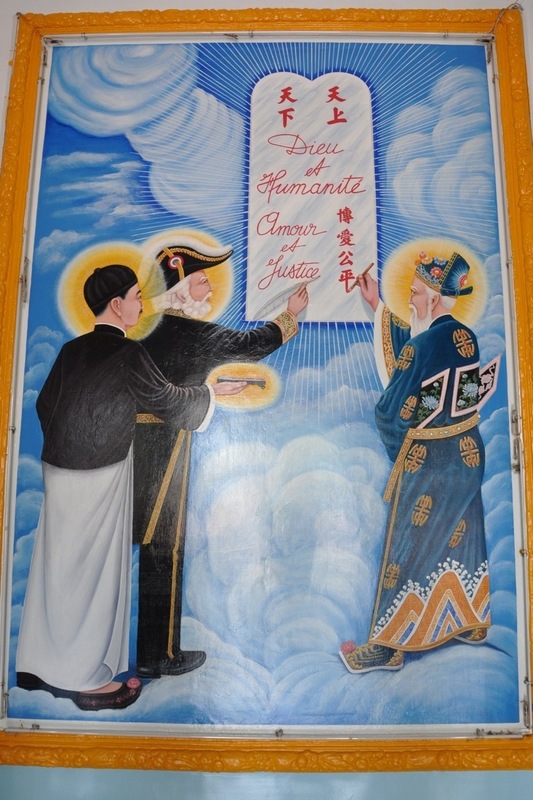 However, the big three spiritual guides who get a mural in the temple lobby are Sun Yet-Sen, leader of the 1911 Chinese revolution; French poet and playwright Victor Hugo, known as the “spiritual chief of foreign missions of CaoDaism” and Nguyen Binh Khiem, Vietnam’s first poet-laureate. In addition to having a host of saints, the religion is structured like Catholicism with a pope, cardinals, archbishops, bishops, and priests. Women often serve in powerful positions within the CaoDai church although they cannot be pope or a legislative cardinal. We get a back stage pass. Our bouncer beckons us to follow him as he takes us to the back of the temple. Nodding, he pantomimes a camera click. We definitely are getting special treatment. 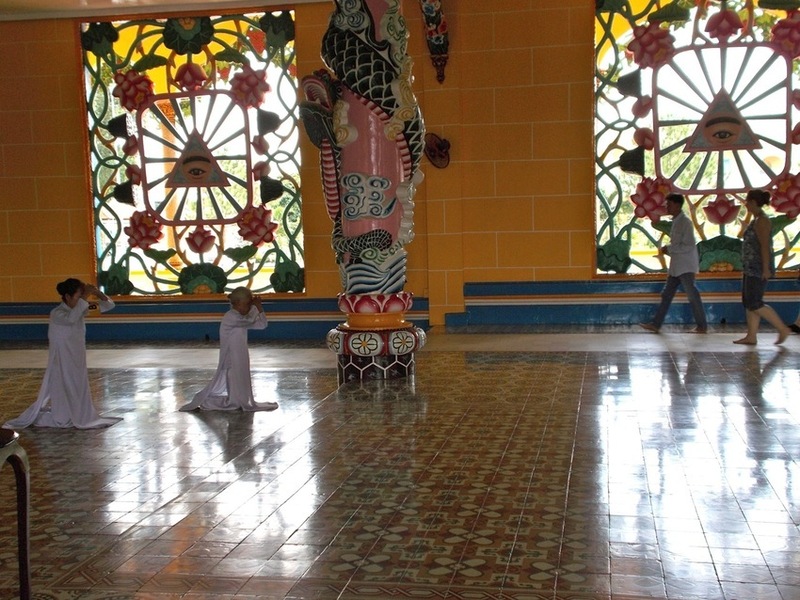 Upon initially entering the temple, we had been told to remain on the white tiles that mark the sides of the sanctuary. Now, with our all-access pass, we are standing on the multi-designed tiles in the middle of the temple near the sacred alter. A massive blue sphere with the Divine Eye sits on a wooden table. Golden candle fixtures, flowers, tea, incense and fruit offerings lead up to the sphere. Near the base of the alter, someone left a durian, the revered yet notoriously stinky tropical fruit with a spiky exterior. From our new vantage point, we can see the carved figures near the ceiling. Jesus, Buddha as well as two important CaoDai historical figures, Cuong Thai Cong and Thai Bach, are stacked on top of each other totem pole style. 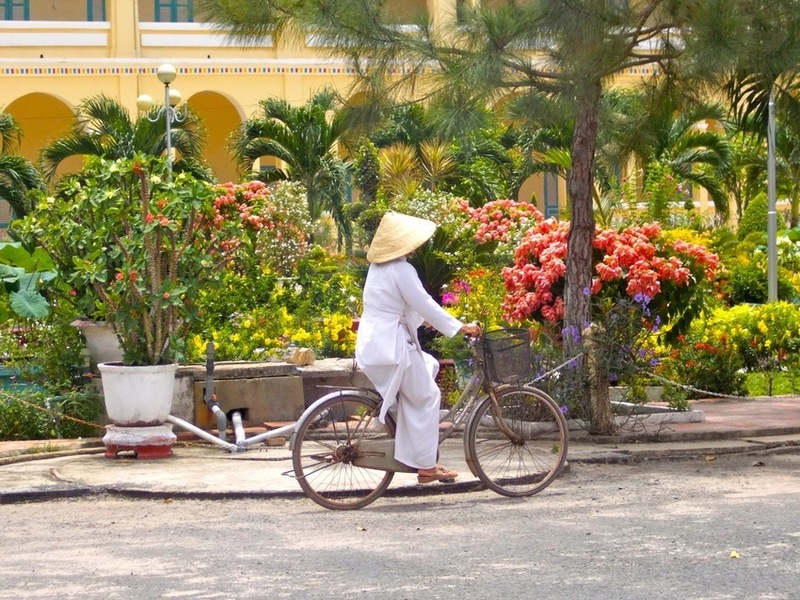 The appeal of CaoDaism attracted many followers in Vietnam, especially in the south. In the 1940s and 1950s, the religion had close to two million members. During this volatile period, when Vietnam was fighting the French for independence, CaoDaists actually held some political power and had a private army. In 1975, many CaoDaists fled Vietnam since they had opposed the North Vietnamese Communist government and the Viet Cong during the war with the US. 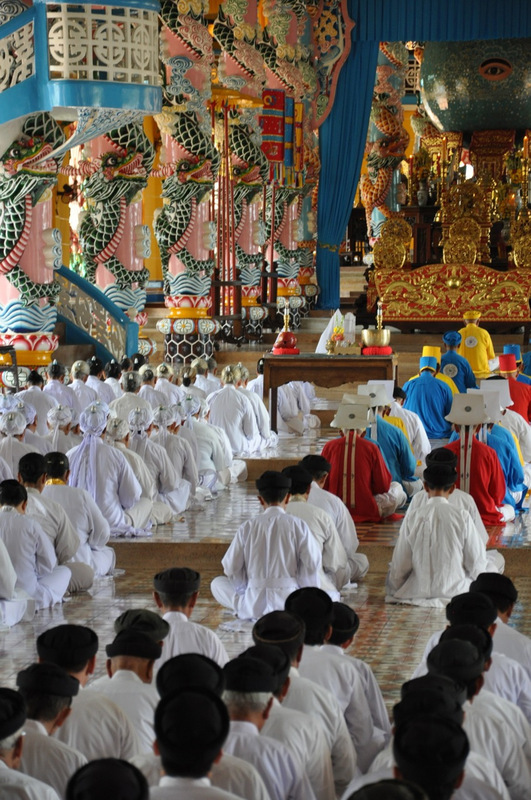 In 1997, the Socialist Republic of Vietnam officially recognized CaoDai as a legitimate religion. We leave the temple temporarily while the CaoDai faithful prepare for the noon service (four separate services are held every day). 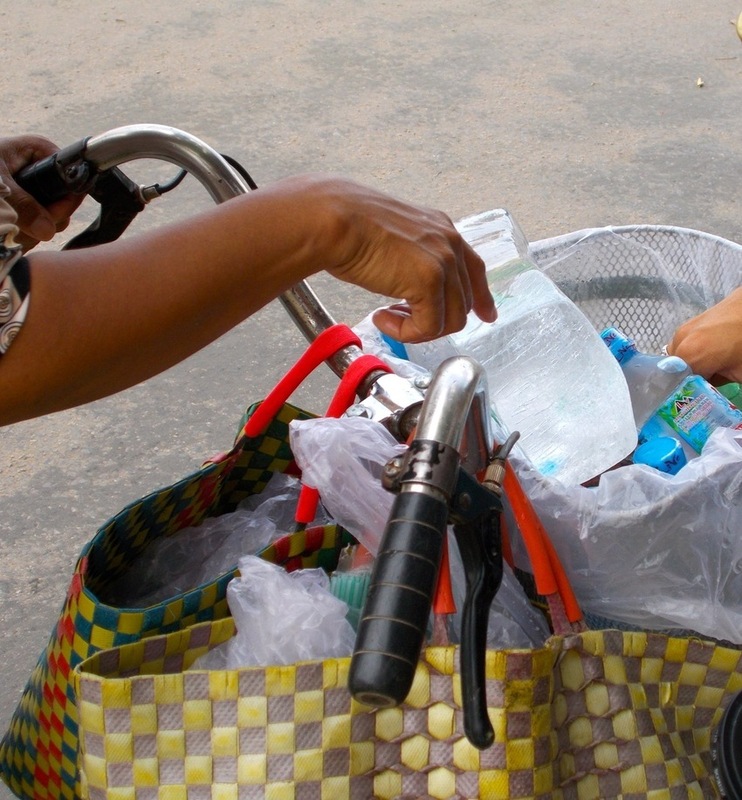 In Tây Ninh’s heavy heat, we wait outside with the other tourists near a forested area roaring with cicadas. Vendors show up with sodas, water and fruit drinks. One woman has a large ice chunk placed on top of the drinks. I consider paying just for the ice chunk. On the temple compound’s wide boulevard, a Toyota Fortuner SUV revs up to the curb, dropping off a family of followers. Stepping on to the sidewalk, the women pull their white garbs over their street clothes. Three kids in tiny white tunics hold their mother’s hands while they hurry to the temple. Taxis also arrive, letting out followers who leave lineups of shoes outside the temple’s main entrances. Allowed back into the Holy See, Deb, Binh and I are part of a sweat-packed cluster of spectators. 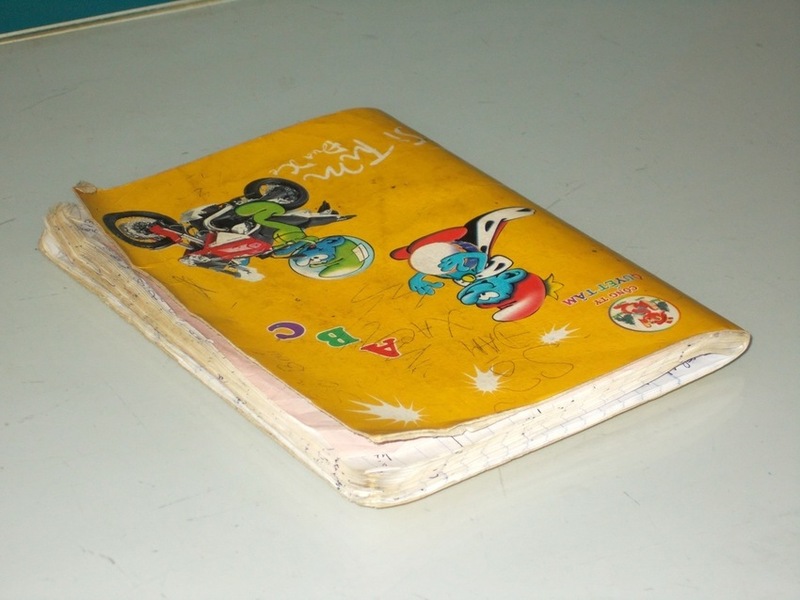 At a reception desk near the entrance, I spot a small notebook decorated with Smurf stickers. And why not? 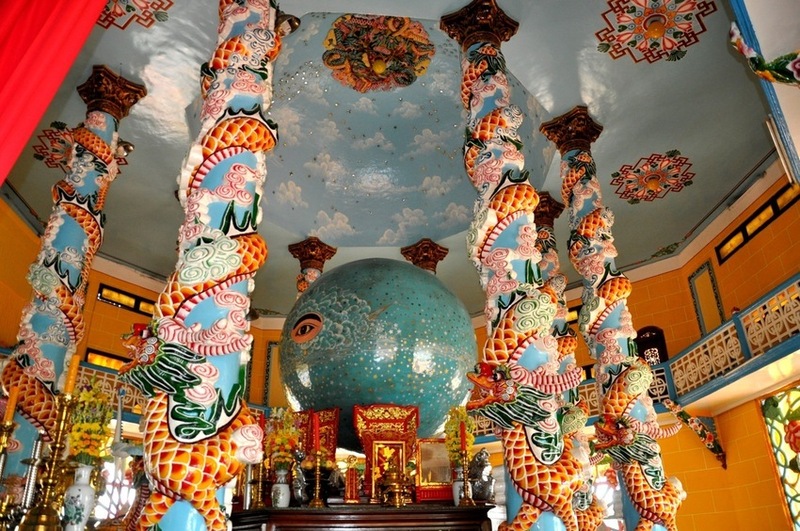 Nothing is really surprising at this temple. We sit in the foyer and watch the devotees kneeling and chanting while a gong sounds intermittently. Looking ahead, I see our security guard, presiding over a section of worshipers. He had replaced the jaunty black turban with a Papal hat. Although I’m not sure of his official rank, I know we got the VIP tour with a holy bouncer. 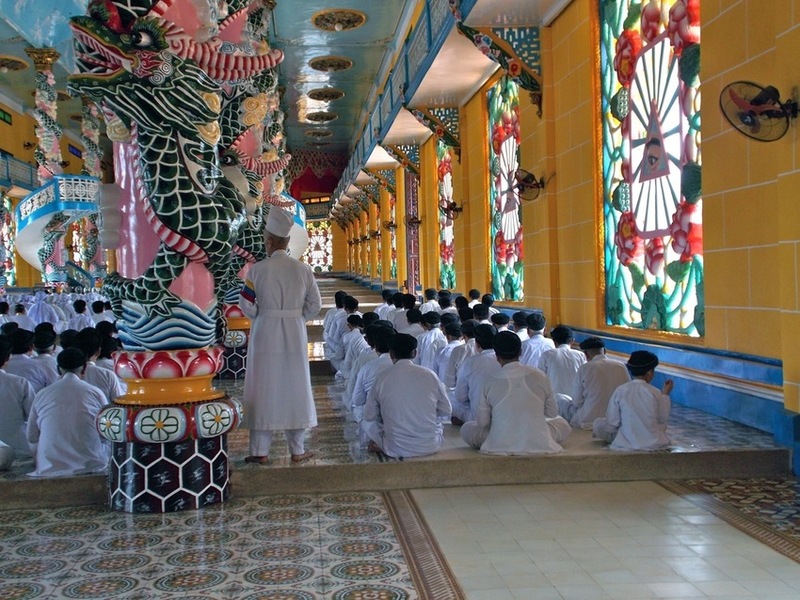 This entry was posted in Culture, Travel, Travel Humor, Uncategorized, Vietnam and tagged Cao Dai, Cao Dai Temple, temples, Vietnam by stephglaser. Bookmark the permalink. That was a fascinating post. Thanks. Thank you! The temple and religion were definitely fascinating. I had never heard of CaoDaism before, so the trip to the temple was well worth it. Cheers! CaoDaism is definitely unique — and speaking of libraries, I learned about CaoDai in a children’s book on Vietnam that I had checked out so I could read it to my kids. The temple is pretty crazy, and a visit there was definitely a highlight of my trip to Vietnam.